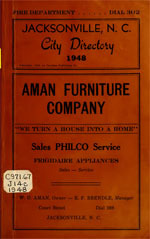 The North Carolina City Directories collection in DigitalNC continues to grow. There are now more than 900 directories online, spanning more than a century. Published from early 1860s to the early 1960s, the directories cover cities and towns across North Carolina. There are 107 cities and 63 counties represented in the online collection. Most of the directories that were digitized come from the North Carolina Collection at UNC-Chapel Hill, though several other libraries have contributed copies, including the Durham County Library, Duke University, the Forsyth County Public Library, and the Hickory Public Library. We are making an effort to include every available North Carolina city directory published through 1963 (later editions have a different copyright status). If you know of city directories in North Carolina libraries that are not included on this site, please let us know.